Home > Dogs & Cats > Feel Good Stories > Wondercide > Giveaway Alert! Win Wondercide and Faucet Face Prizes for Your Pack! Giveaway Alert! Win Wondercide and Faucet Face Prizes for Your Pack! 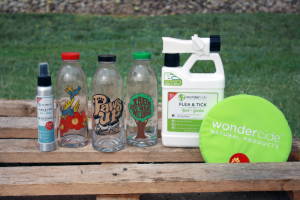 Wondercide and Faucet Face have teamed up for a great big November giveaway, featuring natural flea & tick control and glass water bottles, all for one lucky winner! So, what are you waiting for? Enter to win* using the link below between 12am CT Saturday, November 5th and 11:59pm Friday, November 11th! Why natural flea & tick control? Protect without poisons with Wondercide’s Flea & Tick Control for Pets + Home and Flea & Tick Control for Yard + Garden. 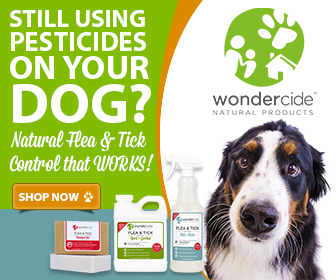 Wondercide uses the natural power of cedar oil to kill fleas, ticks, and mosquitoes, without any chemical pesticides. In this prize pack, you’ll win a 4oz bottle of flea and tick control spray for pets and home interiors, a ready to use yard treatment for fleas, ticks, and mosquitoes, as well as a Wondercide plush dog toy for your pack! Have you ever noticed how everything tastes better in glass? That’s because glass won’t taint liquids like plastic or metal can. You already use glass for wine and other beverages, so why not for your water? Plastic water bottles have also been shown to leach chemicals into the water. Each time you drink from them, there’s a good chance you’re ingesting things like estrogenic compounds. Yuck! Ready to give glass a go? You can win Faucet Face bottles with a “Hummingbird Feeder,” “Paws Up for Animal Rights,” and “Trees Are What We Need” design in this giveaway!